In a blow to the Japan Aerospace Exploration Agency (JAXA), the organization announced on April 28 it has given up on regaining contact with crippled X-ray astronomy satellite ASTRO-H, also known as Hitomi. JAXA concluded that it is impossible to restore communications with Hitomi, which went dark about a month after launch, as it is highly likely that solar battery panels that served as power sources became detached from their bases. “There were human errors. But a bigger problem lies with our entire system as we were not able to detect those errors,” said Saku Tsuneta, director of JAXA’s Institute of Space and Astronautical Science. JAXA had planned to investigate black holes and other cosmic phenomenon with Hitomi. However, that research is likely to be delayed. Hitomi, launched Feb. 17, lost communications with ground control at around 4:40 p.m. on March 26. It was later determined through observation that the satellite had broken up into several pieces and the main body was spinning in orbit. JAXA investigated the causes and discovered that Hitomi began spinning due to incorrect programming for positional control. The satellite automatically tried to correct its positioning. However, signals that had been transmitted to the satellite in advance contained errors. As a result of those miscalculations, the spinning accelerated, and centrifugal forces wrenched the solar battery panels and a long observational platform from their bases. 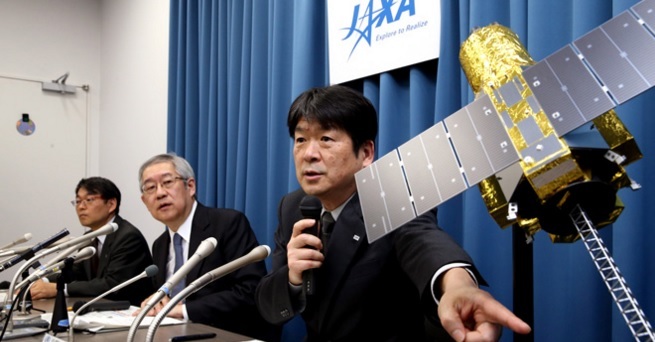 Initially, JAXA said that it continued to receive electric waves from Hitomi for a short time even after it became impossible to communicate with the satellite. It hoped that if the solar panels were turned toward the sun, it could restore the satellite's functions. However, JAXA later discovered that the waves were emanating from a different satellite. "JAXA expresses the deepest regret for the fact that we had to discontinue the operations of ASTRO-H and extends our most sincere apologies to everyone who has supported ASTRO-H believing in the excellent results ASTRO-H would bring, to all overseas and domestic partners including NASA, and to all foreign and Japanese astrophysicists who were planning to use the observational results from ASTRO-H for their studies," JAXA said in a statement. Japan is a world leader in X-ray astronomy, which researches the origins of the universe through X-ray observations. Hitomi is a sixth-generation satellite of that kind for the country. Japan jointly developed the satellite with other nations including the United States. Japan shouldered about 31 billion yen ($290 million) for its development. You can't test space stuff too much. At least they made a mistake more complex than when NASA mixed up the English and metric measurements. I think that one made a new crater on Mars. Then they got the positive and negative wires mixed up on one of them. I don't remember where that one ended up.